The affordable way to boost your metabolism and burn up fat! Within a couple of days of receiving a B12 injection, many people experience an increase in their energy level and stamina. Vitamin B12 is the only vitamin not reliably absorbed by the stomach or intestinal tract, so an injectable form of the vitamin was developed. Common benefits reported by participants include improved sleep, reduced allergies, reduced stress and depression, improved mood, and less frequent or severe headaches. Vitamin B12 injections contribute to healthier immune systems, and is an essential B vitamin needed to form red blood cells and for proper brain and spinal cord function. As we grow older, we often have more difficulty absorbing vitamin B12 from food. In fact, a vitamin-B12 deficiency is one of the most common deficiencies. 85 percent of us come up short of the necessary B12 from our diet. Absorption of B12 in food requires a substance from our stomachs called intrinsic factor, the production of which decreases with age. In fact, The American College of Physicians assumes that no one has intrinsic factor past age 70. 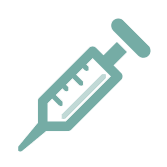 Vitamin B12 shots are most effective when taken at regular intervals. A regular schedule to receive the injections can be customized to each individual. People with chronic fatigue or anemia require regular injections of vitamin B12 because the oral form is not dependable. Some redness and swelling at the injection site may occur. This should start to get better within forty-eight (48) hours. Sensitivity to cobalt and/or vitamin B12 is a contraindication. People with chronic liver and/or kidney dysfunction should not take frequent B12 injections. Improve sleep, reduce allergies, reduce stress and depression, improve mood, and less frequent or severe headaches, improve immune system and detoxify! The only way to spot reduce! Prevent your weight loss from being temporary! Burn more fat, increase energy and detoxify!